Human, interdisciplinary and deeply professional. These are the characteristics that define the team of the winery, which is leaded by the enologist and commercial director Ana Cabestrero. A small but specialized and multi-faceted team at the same time, due to the characteristics of our “house”. Ana Cabestrero Keeps the commercial and enological vision up, as an effect of the dedication of more than a decade to the winery and of a whole life between vineyards. In addition, she is the “capataz” of the winery, one of the few women who dedicates herself to these tasks in the “Marco de Jerez”. Along with her, in administration, Blanca García, and, into the winery, Eduardo Valderas, Cayetano García (Tano) and Ángel Rodríguez. They dedicate themselves to the care of quality wines the qualities of the wines so that from the tradition, and through of an artisan R + D + i process, these remain constant. 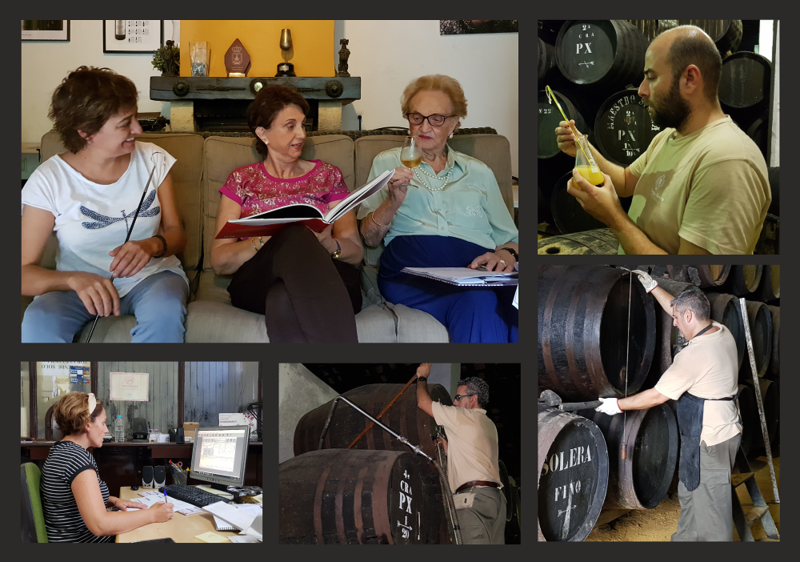 Indisputable part of the team is Mrs. Pilar Plá, who continues inspiring every moment with her daily presence in the winery; and Mari Carmen Borrego Plá, who from the management promotes the defense of the sherry culture as part of our intangible heritage. Tradition, innovation and maximum quality are our hallmarks. «A day without wine is a day without sun».